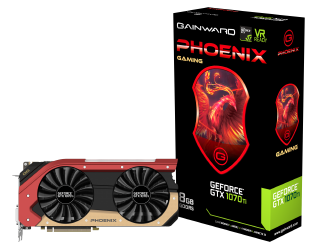 As the leading brand in enthusiastic graphics market, Gainward proudly presents the new GeForce® GTX 10 series - Gainward GeForce® GTX 1070 Ti Phoenix and Gainward GeForce® GTX 1070 Ti. Gainward GeForce® GTX 1070 Ti series is the most advanced graphics card, accelerated by the groundbreaking NVIDIA PASCAL™ architecture to deliver an unbeatable 4K and virtual reality experience. With the most advanced process – 16nm FinFET, the Gainward GeForce® GTX 1070 Ti series deliveries powerful graphics performance with extremely high efficiency power usage. By adoption of the 8GB GDDR5 memory, the Gainward GeForce® GTX 1070 Ti series gives you amazing gaming performance by up to 3 times faster than previous generation. Gainward GeForce® GTX 1070 Ti Phoenix comes with Phoenix cooler design, provides extreme high thermal performance with very low acoustic level even under heavy-loading gaming environment. The cooler design is also including a LED-lighting loading indicator that gives users clear indication for the GPU temperature range. And, a “dual BIOS” design brings the confidence from a second VBIOS on the board that provides backup-BIOS to boot up whenever needed. Both Gainward GeForce® GTX 1070 Ti Phoenix and Gainward GeForce® GTX 1070 Ti are designed with DrMOS on PWM circuit for those 2432 cores that provides extremely better power efficiency than normal PWM design. Gamers will enjoy the advantage with Gainward’s superior hardware design. 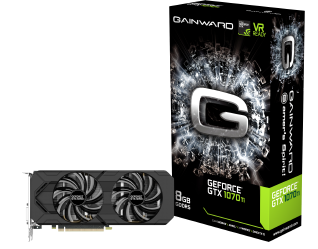 Gainward GeForce® GTX 1070 Ti series is built for the most demanding gaming enthusiasts, users will experience a whole new class of the performance enhanced 4K gaming environment with it.